JOHOR BAHRU, 1 October 2018 – A Memorandum of Understanding (MoU) agreement signing ceremony between Universiti Teknologi Malaysia (UTM) and CCM Duopharma Biotech Berhad was held at the Senate Hall, Sultan Ibrahim Chancellery building, UTM campus in Johor Bahru. The agreement was signed by the Vice Chancellor, Prof. Datuk Ir. Dr. Wahid Omar on behalf of UTM while the CCM Duopharma was represented by its Group Managing Director, Leonard Ariff Abdul Shatar accompanied by Chief Technical Officer, Madam Ng Su Yee. Prof. Wahid in his speech has mentioned that UTM is a leading innovation-driven entrepreneurial research university in engineering science and technology. “Therefore UTM now seeks to collaborate with key leading industrial partners under a “Partnership with Industry” programme. Meanwhile, CCM Duopharma Biotech Berhad is a leading pharmaceutical company in Malaysia,” said Prof. Wahid. The signing of the MoU shows the support of the industry towards the development of research programs at local universities. This collaboration also represents the determination of two parties in support of the government’s efforts in building Malaysia into a developed nation by the year 2020, through strategic planning and systematic in enhancing the pharmaceutical services delivery through research, development, and innovation. “The collaboration provides an opportunity for both sides to implement staff exchange and research programs as well as the use of laboratory facilities. 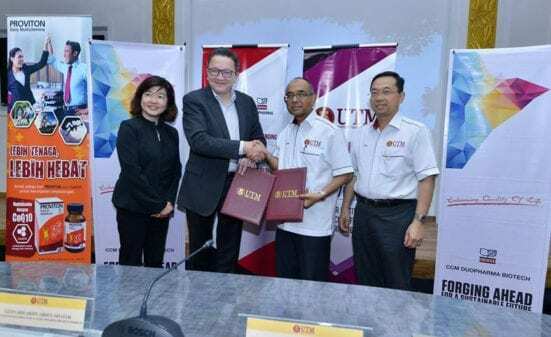 “UTM hopes that the signing of the MoU will be a starting point for future partnerships in the sharing of expertise in particular to boost research activities in the country,” said Prof. Wahid. The ceremony was also attended by Deputy Vice-Chancellor (Research and Innovation), Prof. Datuk Dr.. Mohd Fauzi Ismail, Director of Ibnu Sina Institute for Scientific and Industrial Research (ISI-SIR), Prof. Dr. Abdull Rahim bin Mohd Yusoff, Director of Centre for Sustainable Nanomaterials (CSNano), Prof. Dr. Hadi Nur, senior officers as well as UTM researchers and students. From left, Madam Ng Su Yee, Leonard Ariff Abdul Shatar, Prof. Datuk Ir. Dr. Wahid Omar and Prof. Datuk Dr. Ahmad Fauzi Ismail at the MoU signing ceremony.